Lamp brush chromosomes were observed in Salamander (amphibian) oocytes in 1882. Lamp brush chromosomes are look like the brushes which were used for cleaning purpose. Lamp brush chromosomes occur at the diplotene stage of meiotic prophase in the primary oocytes and spermatocytes of many vertebrates and invertebrates. They were observed even in some plants like Acetabularia. A lamp brush chromosome actually contains two homologous chromosomes. The two homologous have separated except at several joined points chiasmata. Each homologue at this stage has two chromatids. The lamp brush appearance of the two homologues in a chromosome is the result of the threads that loop out from its two chromatids. The loops occur in pairs. The loops are made up DNA with associated RNA and ribosomes, and are sites of transcription. The axis of the chromosome consists of a string of fine chromatin granules called chromomeres. One or many pairs of loops extend from each chromomere. In this arrangement each chromatid consists of a sting of chromomeres with attached loops. Since the two chromatids are tightly opposed to each other, the chromosome axis is probably by fused pairs of chromomeres. 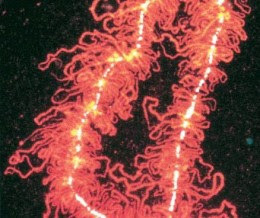 Experimental evidences show that each loop is single DNA double helices.